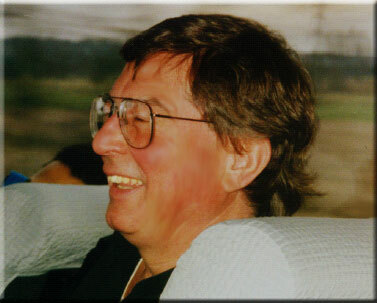 Wayne Andre passed away at home at 10:10pm on 8/26/03. We were all able to say good-bye and I was with him at the end. We would prefer people make donations in his name to VH1 Save the Music. or on line at www.vh1.com and click on the "Save the Music" icon at the bottom of the page. Then click "make donation" and indicate that the donation is in honor of another. You will be asked for Wayne's name after you fill out the donation form. Andre started his long career performing with and writing for Charlie Spivak, Sauter-Finnegan, and Woody Herman. He composed his Nutcracker and arranged The Preacher for the Kai Winding septet in the mid-1950's. Many of his arrangements, such as Sentimental Over You, are still performed in music schools and by bands around the country. In the 1960s, he performed with Gerry Mulligan's first Concert Jazz Band, the Thad Jones-Mel Lewis Orchestra, and Clark Terrys big band. He also joined Benny Goodmans Mission to Russia in 1962. After settling in New York City, Andre became a sought-after studio sideman and soloist, recording with top artists in many genres. His solos may be heard on such varied albums as Liza Minellis More Than You Know on Liza with a Z, and Alice Coopers Blue Turk on Schools Out. The New York Chapter of the National Academy of Recording Arts and Sciences, the association that presents the annual Grammy Awards, presented Andre with the Most Valuable Player Award in 1982 and 1986. However, his heart remained with Jazz. During this time he also played with Lynn Welshmans Tentet, The Mingus Big Band and Epitaph Band, Jaco Pastorius Word of Mouth band and many others. He also performed with his own quintet and septet. 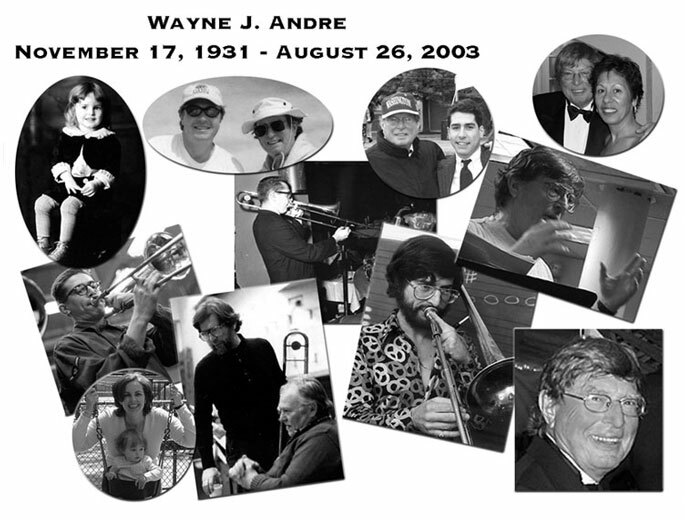 (continued) A graduate of Manhattan School of Music, Wayne Andre dedicated his life to the furtherance of music and music education, giving encouragement and inspiration to many young musicians and composers. In May, 1995 the NY Brass Conference honored him for his life-long dedication to music. At that event Berklee College presented him with a plaque in recognition of his life long service to and contributions in the music industry. 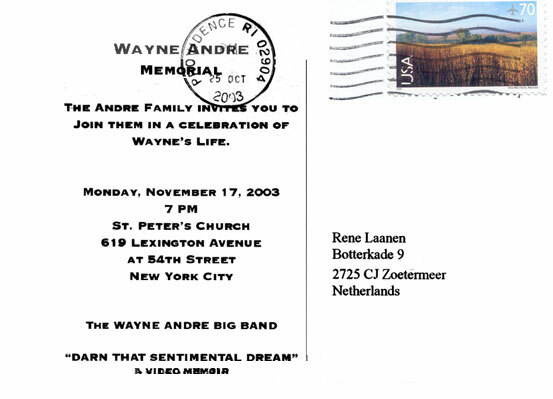 Wayne Andre continued to write music throughout his life. He premiered his composition for trombone and symphony orchestra, The Rise and Fall of Love, with the Oslo Big Band Orchestra in Norway. Andre enjoyed writing for and performing with his own big band. Recently he had been performing with Mike Longos New York State of the Art Jazz Ensemble. Wayne is survived by his wife Lourdes, his sons Matthew and Keith, his daughter-in-law Cynthia, his grand daughter Emily, his sisters Claire and Gail, his brother-in-law Kenneth, and countless others who loved him. Dear Wayne, Thank you for sharing your marvelous trombone talents with the rest of us. God Bless you! 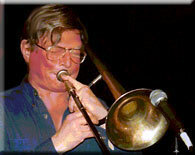 ~ René Laanen, Trombone Page of the World. Billy Taylor Trio Up-Tempo Taylor!